I’m a born leader. A natural engager? Not so much. I’m a classic firstborn. I babysat my brother and sister in junior high, won a seat on Youth Council and earned valedictorian in high school, and went to college on a full scholarship. After college, I led project teams, then a team of direct reports, and then became a firm partner by age 30. But I had a lot to learn about true influence. We now live in a world where “born leaders” no longer have the impact they once did. We must learn to upgrade to a new level of influence. When I started my career in the early 1990s, a strong leader was in high demand. The past couple decades had seen a transition from what could be called the “Influence 1.0” model of the Industrial Revolution. From the early 1900s through the post-WWII years, management was key to success in the industrial era. The assembly line of Henry Ford and the scientific management principles of Frederick Taylor, Frank and Lillian Gilbreth, and W. Edwards Deming proved that management skills created efficiency and impacted the bottom line. Influence 1.0 was the domain of supervisors and middle management. In the 1970s and 80s, as the economy shifted to the Information Age, attention shifted to the leverage of a key leader especially the role of CEO. Lee Iacocca led Chrysler’s turnaround and became a TV personality with commercials that challenged, “If you can find a better car, buy it.” Jack Welch was trimming 25% of GE’s workforce and increasing the company’s value 4000%. Warren Bennis published On Becoming a Leader. CEOs started earning breathtaking pay levels. In the industrial economy, CEOs had earned about 20 times more than typical workers. By 2000, CEOs were earning about 400 times more than typical workers. But by then, the world of influence was again changing. For decades, Influence 2.0 had been producing superior business results. But then its results fell to simply average, quietly surpassed by a new mode of influence. Influence 3.0 is not about you and your vision; it’s about the team. It’s about the team making things happen — things that you and the team care deeply about. You are a leader, but you aren’t the center. You aren’t driving the team and making decisions; you cultivate a team that makes decisions. You stimulate healthy dialogue, help the team discover its purpose and vision, and help the team stay focused on its purpose and the results that matter. I don’t know where we should take this company, but I do know that if I start with the right people, ask them the right questions, and engage them in vigorous debate, we will find a way to make this company great. Management was Influence 1.0. Leadership was Influence 2.0. 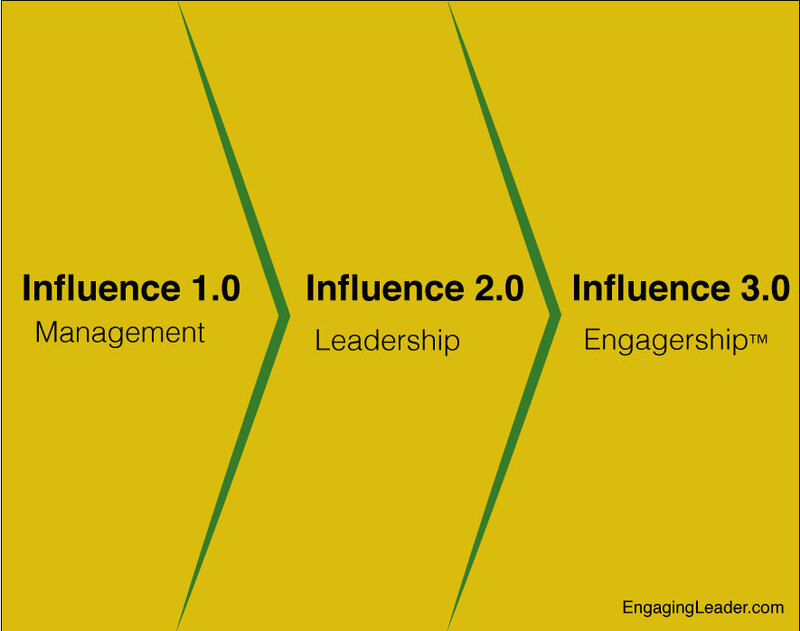 What’s changing the world today is Influence 3.0: Engagership. What do you think are the new skills of engagership? Let us know in the comments section!